I couldn’t have projected my future at Wake Forest University School of Divinity. I came with a single burning question: “How does food relate to our faith?” As I write this, it is six o’clock in the morning and I am preparing for a very full day of classes, events, administrative duties, and a neighborhood distribution event. I sit here with answers, multiple answers. The one answer that shakes me to my inner most inner self, is that our faith cannot be understood without the lens of food and ecology. Winston-Salem is one of several cities in NC that have the highest levels of food insecurity in the country. 1 in 4 children experience poverty. 62,590 people are food insecure in Forsyth County alone, and of those 31% don’t qualify for SNAP Benefits. There are 21 food deserts in Winston-Salem…21. The USDA Defines Food Deserts as parts of the country lacking fresh fruit, vegetables, and other healthful whole foods. They are usually found in impoverished areas. This is largely due to a lack of grocery stores, farmers’ markets, and healthy food providers. During my second year of divinity school, I along with other colleagues participated in an interdisciplinary course for the Food, Health, and Ecological Well-Being program. In this course students were invited to delve deeper into understandings of theology, ministry, and practice through real research and data. The class was invited to make space for partnerships over privilege. The idea for New Communion: Mobile Market and Food Pantry came out of that experience. In October of 2015, we decided to pursue a grant through the United Way of Forsyth County. The proposal was for a mobile market that would redistribute resources to neighbors experiencing food insecurity and allow for better access quality food. New Communion, a ministry of First Christian Church, sought to partner with Wentz United Church of Christ which is located in the area we intend to serve. November 17, 2015 New Communion submitted a letter of intent to the United Way as a preemptive application for the Place Matters Grant Proposal. Mid-December final grant proposal and letters of community support were submitted and accepted by United Way of Forsyth County for the Place Matters Initiative. After months of interviews, conference calls, and site visits, we received the grant. New Communion was now able to operate a mobile pantry unit servicing those with limited access to fresh food and pantry items in Forsyth County. In June, we received the initial distribution of grant funds and we purchased a cargo van from North Point Chrysler Jeep Dodge in Winston-Salem. Thanks to local support the van was “upfit” with professional graphics and shelving. New Communion began limited services July 1, 2016 and became fully operational by the end of August. New Communion is an interfaith initiative focused on food security. We partner with neighborhoods, local churches, faith communities, farms, individuals community gardens, and corporate sponsors. 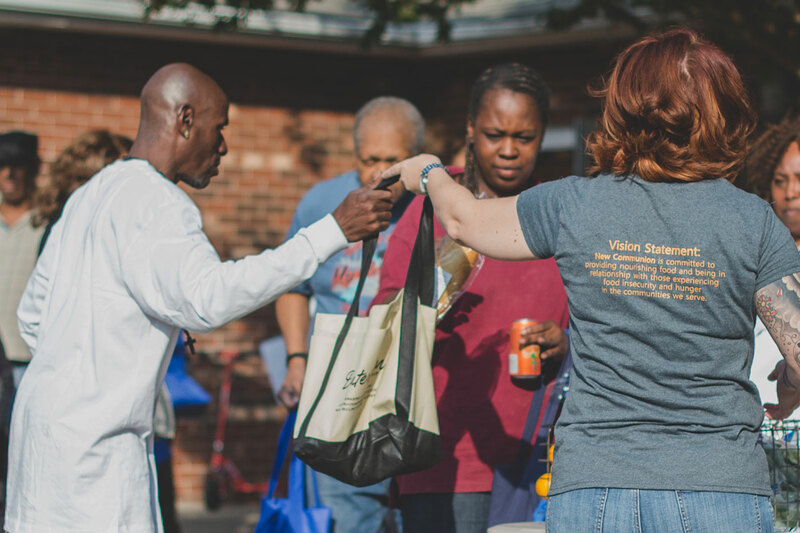 In the first three months of service, distribution and operation, New Communion has provided pantry items, fresh produce, and fresh baked bread to families experiencing food insecurity in Winston-Salem. We serve 80-100 families each week. We know our neighbors and our neighbors know us. New Communion is committed to the model of Asset Based Community Development and the mindset of shared abundance in ways that transform individuals and systems of poverty. New Communion functions as an interfaith organization and utilizes interdisciplinary practices in order to promote healthy food systems through shared abundance and redistribution of resources. Due to limited funds and initial financial resources, we are seeking partnerships and donations. We are always in need of volunteers with a multitude of skills. Cash and check donations are accepted at First Christian Church of Winston-Salem Monday to Thursday between 10:00 a.m. and 4:00 p.m. Checks can be made payable to First Christian Church with “New Communion” in the memo line. For more information to discuss ways you’d like to partner, contact Monica Banks (336) 918-7614, the church office at (336) 722-2714, or email us at newcommunionws@nullgmail.com. Together, we can feed our neighbors, through shared abundance.